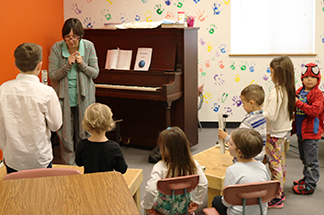 King of Glory offers Sunday School for all ages – preschool thru adult. Our children’s Sunday School lessons focus on Bible stories from the Spark Sunday School curriculum. Children will explore the Bible through art, music, storytelling/drama, Bible skills/games or cooking. Youth Group Students in grades 6-12 (Youth Group) will have a theme of ‘Service’ this year. We will be studying New Testament stories about how we can best serve Christ by serving others. Confirmation Class Twice a month, we’ll also have confirmation classes during Education Hour. Seasonal Activities – An Advent Gathering (Fall) and Lenten Gathering (Spring) will provide activities for children, youth, and adults to grow in their understanding of these two seasons of the church year together! Safe Haven Policies will be followed in all Sunday School and youth ministry programs. Background checks are required for all volunteers working with youth and children. To Sign Up / Volunteer Contact Pastor Ruth Ann at ruthann@aplace2grow.org or the church office for more information or to sign up to help.